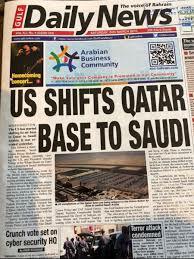 This past Thursday, Debka reported that the U.S. military has liquidated its two major air bases in the Middle East, at Incirlik (Turkey) and Al-Udeid (Qatar). Various facilities and capabilities will be moved: from Qatar to Saudi Arabia, and from Turkey to various friendly Middle Eastern countries. Air bases are designed to be liquidated and relocated in a short period of time. For historical context, we recall a similar event in the past. In 1969, King Idris of Libya was undergoing surgery in Athens, Greece. Taking advantage of his absence, Col. Muammar Qaddafi over threw the government and seized control in Libya. At the time, Wheelus Air Base outside of Tripoli was the largest air base outside the United States. Its operational capabilities were dispersed, in particular to Hellenikon, near Athens. Next Story → France: Soon With No Jews?